The last two years have been sub-optimal in the annual Michigan/Michigan State game. In 2008, it was a catastrophe as most games that year were. Last year's game was utter heartbreak and the beginning of Michigan's slide into irrelevance. Let's hope 2010 is filled with less overtime interceptions and crushing defeat. Yep, you read that correctly: Michigan now has the worst pass defense in the country re: yards per game. And despite MSU being a run-first team, you can expect a heavy dose of Kirk Cousins torching the Michigan defense. Despite MGoBlog's assertion to the contrary, I expect Michigan State to greatly exceed their pass-to-rush ratio in this game. The worst passing defense in the country is not something that teams just ignore, and given MSU's obsession with beating Michigan and their preparation for the game, I expect to see more three-wide sets than I-formation tomorrow. That's not to say that stopping MSU's stable of running backs won't also be important, but Cousins has a few weapons around him to throw the ball to and I expect to see a lot more passing than you'd expect or that MSU has shown this year. On the other side of the ball, the big matchup everyone wants to see is All-World Linebacker Greg Jones versus Denard. Jones might provide the greatest test to Denard all season, as an athletic linebacker that is great in space. If any Big Ten linebacker has a chance at slowing Denard, it's Jones. However, Rich Rod has proven an ability to get the matchups he wants. Michigan will probably run a lot of looks with one or two H-backs in the game who will be responsible for blocking Jones. Otherwise, Denard will probably look to get to the edge of the field and avoid running into Jones through the tackles. Through the air, MSU is vulnerable, much like last year. Michigan's passing game has been shredding defenses because of their need to overplay the run. And with Denard's ability to throw the deep ball, it's his passing, rather than his running that could really hurt MSU. But a lot of that depends on whether or not Michigan can nullify Greg Jones and get a few 15+ yard rushes. 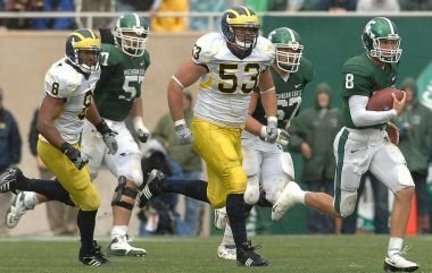 Prediction: Before the season and during the first two weeks, I felt confident that this game would be in Michigan's favor: aside from Michigan's offensive talent and apparent improvement on defense, the game is in Ann Arbor and is a redemption game for the last two years of MSU victories. But after watching the Indiana game, I've lost almost all confidence in Michigan's defense and Greg Robinson's ability to confuse a quarterback/offense. Kirk Cousins has shown two sides of himself this year: a confident quarterback with a solid command of his offense, able to shred suspect defenses, and an inexperienced player prone to making the Big Mistake. Depending on which Cousins shows up to the game may very well decide who wins. If Cousins is on his game, I think MSU walks away with the game. If he makes the red zone mistakes that he's often made the last two years, Michigan could find their bend-don't-break defense coming up with a few important stops a la the Cam Gordon interception against Indiana in the end zone. Despite Spartan fans feverishly waiting for Greg Jones to demolish Denard, that's not going to happen in this game. Rodriguez will be smart enough to get a blocker on Jones for most of the game and Denard will be able to move pretty well on the ground setting up some of the play action we've seen Rodriguez call. Michigan gets at least one long touchdown in this game but I also expect Denard to throw at least one interception. As always, winning the turnover battle will be key if Michigan wants a shot at this game. I see this one going down as a little less shootout-y than Indiana with both teams getting more consistent stops. Michigan will stop MSU on a few drives when they decide to run the ball on first and second down, and MSU will get stops when Michigan picks up a penalty or has a negative play, which will happen far more often than it has earlier in the season. Jones isn't that great. He's right for their scheme but he's not great in space and he's not an elite sideline to sideline LB like Te'o.